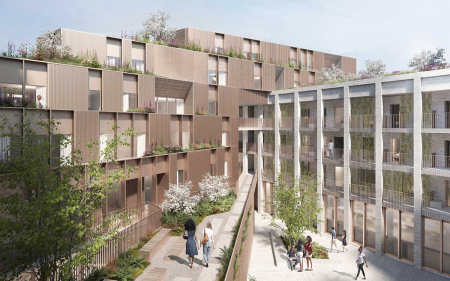 CMA Planning secured approval at the London Legacy Development Corporation (LLDC) Planning Committee for this mixed use scheme on behalf of City & Suburban Homes in May 2018. 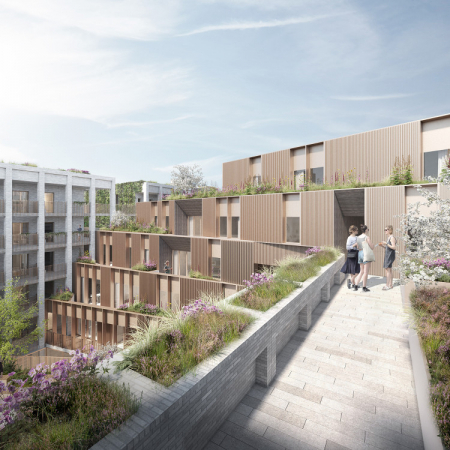 The site, which is located on Trego Road in Hackney Wick, forms part of a wider Site Allocation that encompasses the adjacent McGrath waste transfer site, for which separate approval was granted for the ‘Wickside’ masterplan scheme at the same committee meeting. This project draws on the concept of shared space where residential, making and public spaces meet the scheme is designed around a series of tiered yard, park and garden spaces. Blurring definition and boundaries of planning uses classes, mirroring the organic condition that has evolved in Hackney Wick, the scheme seeks to create shared cross over spaces for communities to meet and form. Evoking the historic language of the more industrial structures of the locale the scheme’s formal and structured masonry street facing elevations are juxtaposed against a more organic informal metallic materiality that lines and defines the yard spaces.